Wake up early. Have some cereal and coffee. Pack along some fruit and head out the door. That’s the typical morning schedule for Pennsylvania resident Marjorie Coblentz.1 Once she’s out the door, her schedule is booked with regular exercise, a part-time job at a gift shop, time with family, and activities with friends. Coblentz isn’t one to spend her free time sitting around. But she could if she wanted to. She’s 92 years old and has almost a century of memories to look back on. She raised a family. She enjoyed a long and fulfilling career as a math teacher. She’s traveled to a long list of destinations around the world. And she enjoys living her best life every day. Coblentz is among a growing population of seniors who are living well beyond the average life expectancy of 78.8 years in the United States, according to the Centers for Disease Control and Prevention.2 She’s even survived a stroke and cancer. So why is she still around? 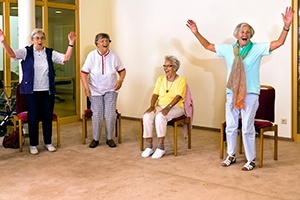 Her habits look a lot like people living in the Blue Zones, first identified in Italy by researchers Gianni Pes and Michel Poulain.3 Then National Geographic writer Dan Buettner set out to try and understand why some people around the world live to be over 100 years old. The project identified regions around the world with a concentration of centenarians (Sardinia, Italy; Okinawa, Japan; Loma Linda, Calif.; Nicoya Peninsula, Costa Rica; Icaria, Greece; Skåne, Sweden). Take a look at the leading causes of death in the U.S.5 and it’s easy to think that improving diet and exercise habits would have the biggest impact on improving mortality rates. If you examine the Blue Zone habits and want to live a long and healthy life, Wellsource Lifestyle Medicine Specialist Dr. Joe Raphael6 suggests you start by living life with a purpose. These habits and daily routines have helped shape Coblentz's life, and may be one reason she’s an active 92-year-old. She can cook healthy meals at home or enjoy a meal in the retirement center where she lives. It’s easy for her to pick and choose to participate in a wide variety of social activities. And she’s made it a point to include exercise as part of her regular routine. She even keeps in touch with classmates from junior high, friends from college, and co-workers from her years as a teacher. She lives with purpose. Examining the habits of people living in the Blue Zones, where living to 100 is normal, could one day help shape decisions about treatment, care, and preventive medicine, and help people recognize the importance of developing a sense of purpose. And that’s something Coblentz has thought a lot about over the years. What can you do to help your population develop healthy lifestyle habits? Coblentz, M. (2016, August 16). Personal phone interview by Evan Jensen at Wellsource, Inc.
Poulain, M., Pes G.M., Grasland, C., Carru C., Ferucci, L., Baggio, G., Franceschi, C., Deiana, L. (2004). Identification of a Geographic Area Characterized by Extreme Longevity in the Sardinia Island: the AKEA study. Experimental Gerontolog, 39(9), 1423-1429. Retrieved September 13, 2016 from doi:10.1016/j.exger.2004.06.016. Buettner, D., Skemp, S. (2016). Blue Zones: Lessons from the world’s longest lived. American Journal of Lifestyle Medicine. Retrieved September 13, 2016 from doi:10.1177/1559827616637066. Leading Causes of Death. (2016). Retrieved September 13, 2016, from http://www.cdc.gov/nchs/fastats/leading-causes-of-death.htm. Raphael, J. (2016, September 12). Personal interview by Evan Jensen at Wellsource, Inc.